Magnum RT Truck Steps by Innovative Creations Inc.
Magnum RT Steps by Innovative CreationsI Inc.give you the rugged and tough appearance you want plus a practical, easy and secure method of entry and exit of your vehicle. These step bars are absolute top quality and are designed and engineered in the USA and built to last, just like your vehicle! Designed and engineered right here in the U.S.A! Magnum RT Side Steps are top quality and built to last! That's why ICI Inc offers a Limited Lifetime Warranty with their Magnum RT Side Steps! Choose from wheel to wheel or cab length. These unique steps are made from extra heavy-duty cold rolled 10 gauge steel and feature a three-stage multi layered matte black textured powder coat finish that resists corrosion and stands up to the elements. The mounting hardware that come with the steps are re-enforced, providing twice the strength of regular truck side step brackets. Magnum RT Steps install quickly and easily with no drilling required! Magnum RT Steps are available for Ford, Chevy, GMC, Dodge, and Toyota including mid-size, full-size and heavy (super)-duty trucks. 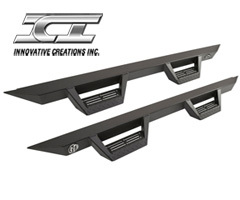 RT side steps are available for the ever popular Jeep Wrangler. Choose from cab length RT Step Bars which run the length of the cab, or choose the full length wheel to wheel opion that run from wheel to wheel with an extra step for easy access to the front of the bed. Heavy duty step bar design with rugged off-road styling. Step pads have aggresive non-slip diamond tread pattern. Nice wide drop step makes entry and exit to your vehicle easy. Three stage multi coating process with matte black textured powdercoat for excellent corrosion resistance. Extra heavy duy mounting brackets (twice the strength or regular running board brackets). Easy, no-drill installation. Can be done within 30mins on most trucks with regular home tools.